My lab uses 7-Mode 8.2.3 controllers N7A & N7B, ONTAP 9.2 clusters C92A & C92B, and 7MTT 3.3. This post goes through the following steps to demonstrate how to transition a vFiler DR relationship to an SVM DR relationship. Note: The below uses all CLI. It is also possible to do most of the below using the GUIs. The following commands create our primary vFiler with a root and a data volume; enable CIFS, and create a test CIFS share. Default password for root on vfiler vf1 is "". The default name for this CIFS server is 'VF1'. Please choose where you would like this account to be created. Welcome to the LAB.PRIV (LAB) Active Directory(R) domain. With a Windows client - on the active directory domain used above - test you can map a drive to the share, and write/read data. The following commands create the vFiler DR configuration. Configuring SnapMirror to mirror vfiler vf1's storage units from remote filer N7A. Volume 'vf1_root' is now restricted. Volume 'vf1_data' is now restricted. SnapMirror transfer initiated for vfiler storage units. 7MTT does not support transitioning vFiler DR, so we must delete the vFiler DR relationship, manually snapmirror the volumes, and we need a temporary vFiler to hold the data volumes. DR configuration deleted for vfiler vf1. We create a secondary SVM as destination for our temporary secondary vFiler. The following commands will configure 7MTT for a secondary project (the secondary vFiler) and a primary project (the primary vFiler). The following commands will cutover the 7MTT secondary and the 7MTT primary projects. 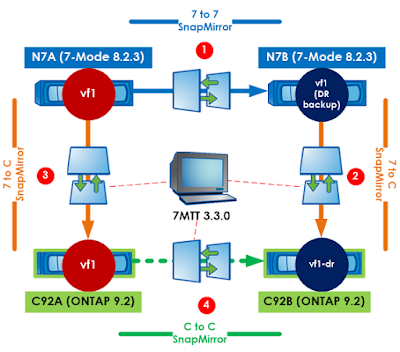 7MTT will establish DR snapmirrors from ONTAP primary to secondary. Since we used a temporary AD machine account for our primary SVMs CIFS server, we can rejoin the CIFS server with the correct AD machine account. The following commands configure an SVM DR relationship.